Skillda Careers, based in the Guinness Enterprise Centre, are holding a free careers conference on 9th December from 6-8pm. 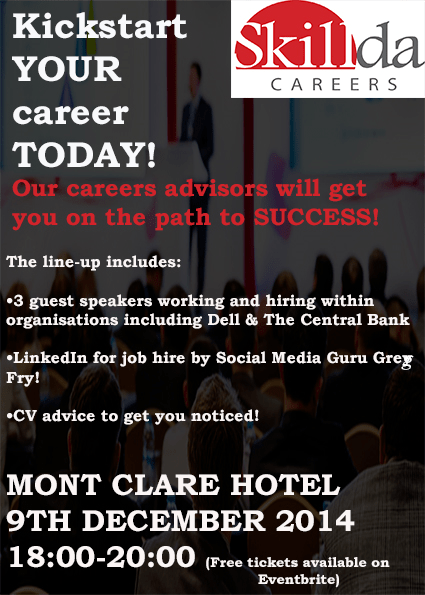 The event is on in the Mont Clare Hotel in Dublin, and will have speakers from organizations including Dell and the Central Bank. All tickets are free for those in the jobs market looking for CV tips, interview and career change advice as well as using social media for job search. Spots are limited and it’s possible to reserve tickets by clicking on the link below.